The Truth of Gujarat raised the following claim on its website yesterday, “Modi’s Litmus test- Delhi election will decide his march to Delhi in 2014”. Its hypothesis is simple. Team Modi’s strategy to ascend the “Prime Minister’s throne” primarily rested on harvesting the massive discontent of the youth of our country, who are stymied by their sweet dreams of “job-apartment-car” gone sour: “The think tanks of the Modi4PM had betted and consequently targeted the youth of India as their winning horse, as they believed that in the present times, this class of citizens of India are the most aggrieved lot. Globalisation had brought the alluring pictures of the west to the backward India by 2000 and the economic boom for a whole decade thereafter had infused the dream of job-apartment-car for the upward mobile middle class”. This massive discontent had been further fueled by the “scandal a day” kind of corruption record set by the UPA government: “The inherent corrupt practices of the ministers of UPA Government provided the right mirchi to the hurt middle class… With too many skeletons in their cupboard, UPA Government had no answer for the Commonwealth Game scam, 2G scam or Coal scam. The city of the snow-balling movement, Delhi, became the most fertile state with a heady mix of propaganda of Good and Bad Governance”. Delhi is voting today for the state assembly. What Delhi decides today, it feels, would be the acid test of whether Modi would best Congress in 2014 general elections. But even before that verdict is out; it seems to have made up its mind that Arvind Kejariwal and Aam Adami Party (AAP) have already hijacked the “massive discontent” of the young electorate: “The Good Governance story of Gujarat now falls on the deaf ears of Delhi youth who are convinced that AAP woud give a corruption free Government to Delhi – a dream sold by Modi”. This conjecture of Truth of Gujarat is based on what it calls the descend of both BJP and Congress into the “time tested methods” of winning elections –plying voters with money and booze: “With the youth of Delhi debriefed due to their involvement in the anti-corruption struggle led by the Aam Aadmi Party, both BJP and Congress appears to have fallen back on the time tested traditional vote catching devices – Alcohol and cash. It is Modi’s Waterloo”. It goes decisively quite far when it terms Delhi elections (or rather its results) as Modi’ Warerloo –a term used to denote comprehensive defeat. The post begins with a video grab of IBN Live (CNN-IBN) channel that shows a carton of liquor bottles with a line emblazoned at the top: “BJP, CONGRESS DISTRIBUTING LIQUOR?” Nowhere in the post “Truth of Gujarat” told us that the Video grab of IBN Live channel is of a “Video clip shot by AAP”, which that party claims shows liquor bottles meant for distribution to voters by Congress and BJP. Of course, anyone even with passing familiarity with the state of electoral politics knows that such “buying of votes” on the election eve is par for the course to all political parties. 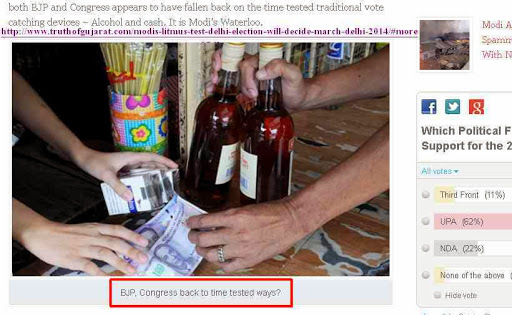 But what caught attention is the following image “without attribution” used by “Truth of Gujarat” with the “punch line” – “BJP, Congress back to time tested ways?” Would it be wrong to conclude from the photograph and the byline that it nails the “truth” of “liquor” and “money” at play in Delhi elections? Take a careful look at the picture! The currency notes most definitely don’t look Indian. That aroused my curiosity. I had images.google.com to look for similar images, and it came up with several options. 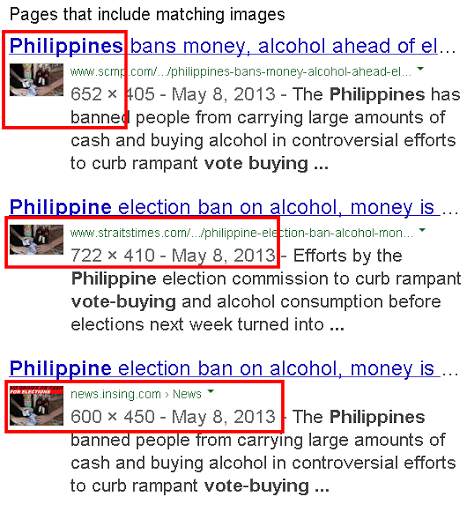 All these websites refer to the elections held in Philippines in May this year: “The Philippines on Wednesday banned people from carrying large amounts of cash and buying alcohol in controversial efforts to curb rampant vote-buying and violence before elections next week. The shock money ban means banks are not allowed to hand over more than 100,000 pesos (HK$19,010) to customers until after Monday’s mid-term elections, the Commission on Elections announced. The commission’s directive also makes it illegal for anyone to carry more than half a million pesos in cash until polls close. “We’re trying to prevent the circulation of cash, which can be used for vote-buying,” its chief Sixto Brillantes told reporters”. South China Morning Post, which carried the foregoing report and above photo, attributes the latter to Agence France-Presse (AFP). Interestingly, one would think it is the photo of a voter in Philippines being bribed with Liquor, Money, and possibly even Cigarettes, as all these items are seen exchanging hands. However, Straight Times of Singapore dispels even that fig-leaf of saving grace to hide the “embarrassment” any person even with a modicum of regard for truth must feel. 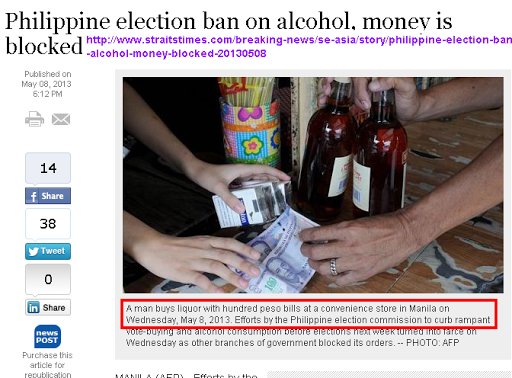 The byline to the photo clearly reads: “A man buys liquor with hundred peso bills at a convenience store in Manila on Wednesday, May 8, 2013. Efforts by the Philippine election commission to curb rampant vote-buying and alcohol consumption before elections next week turned into farce on Wednesday as other branches of government blocked its orders. — PHOTO: AFP”. Clearly, “Truth of Gujarat” is caught on the wrong foot here. Usually, such an error would be easily overlooked, but not so for a website that proudly proclaims, “Lies Are Transient, Truth Is Eternal”.